Let’s see… To help stem the tide of spam comments we started using a new blocker thingy for the site. If you comment and it goes missing then the software probably thought it was spam. Just try again and, uh, I guess try to seem less like spam… I don’t know, I’ll get it sorted out eventually. By the time this goes up I may be enjoying the magic that is jury duty. Inconveinient, but there was a murder around here someplace. It might be fun to hold someone’s fate in my hands… MWAHAHAHAHAHAHAHA! I’ll make a forum topic just in case people want to set up trades or something. What will Reggie do when he finds out Mike hired 5/3rds people? Oh no he didn’t! He’s about to find out that big tempers come in small packages. Yeah, that might not have been the best thing to say. I’m very surprised Reggie hasn’t been killed, maimed or beaten yet. Yeah, very bad thing to say. I’m glad I don’t have a Reggie at work…just a Lenny. It JUST occured to me. I get bored a lot, more often then not lately, and I was re-reading some of your older comics. 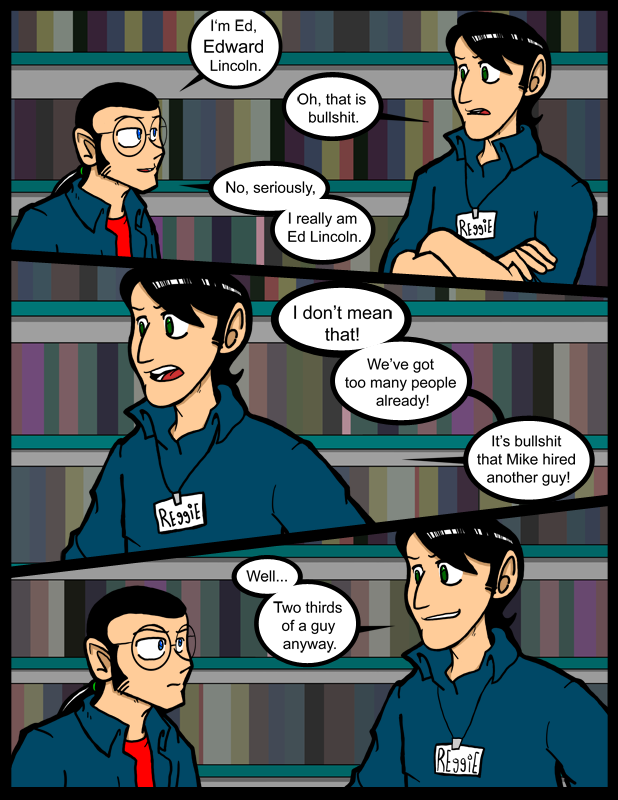 And I was wondering, JT, are you going to have a plot about the Creepy Emo Professor Snape dude in comic #99? The guy who will one day make Carol “his”? Crave: Yeah, I left a few loose ends for the future in case I needed someplace to take the story later. I feel I should comment…. that make’s me cool right? I do not think that Reggie has noticed yet that Ed’s missing height is stored in his forearms. Hopefully we get to see when Ed corrects Reggie’s math. and now that line has been crossed. lol. Reggie’s in for it. And Reginald retaliates with with a shot to Edward’s hieght! That Reggie..heh, heh, heh,.. just can’t pass up a chance to make a new acquaintance into a new and very angry enemy. Oh Reggie, you are gonna get a hurtin’. Oh well, it is convenient that Reggie has a toe-tag all ready to go hanging around his neck. That’ll make the coroner’s job a bit easier. “No really I am Ed Lincoln” That was good. Reggie needs better insults. But the low-blow is legal. Let us hope he can hit harder than that though. And Reggie’s pulled the trigger to the ED CANNON! Brace yourself, Reggie! He should know that short people named Ed does not like height jokes.